The Harvard School of Public Health reports that cutting back on highly processed carbohydrates and increasing your intake of protein can help improve your triglyceride levels and increase “good cholesterol,” or HDL. 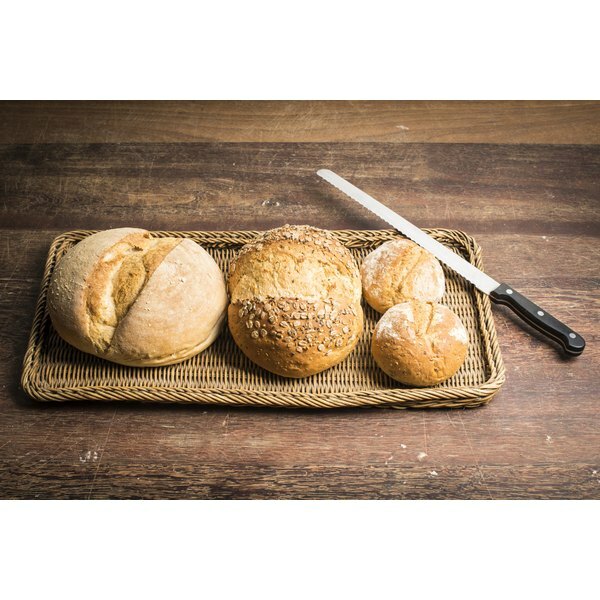 Low-carb protein bread is a good choice for a healthy diet because it provides high amounts of protein and lots of fiber, a nutrient often lacking in low-carbohydrate diets. Soybeans also increase the protein content of the bread. According to the World's Healthiest Foods website, soybeans are considered equal in protein content to animal foods, but do not include the unhealthy saturated fats and cholesterol. Preheat the oven to 325 degrees F. Spray the mini-loaf pans with non-stick cooking spray, and set them aside. Place the softened cream cheese and two eggs in a large mixing bowl. Beat the ingredients together with an electric mixer until the mixture is smooth and fluffy. Add the remaining eggs, one at a time, beating for a few seconds after each addition. Rinse and drain the soybeans, and mash them slightly with a potato masher or fork. Add the beans to the cream cheese mixture, and blend at low speed for two to three minutes, or until the mixture is well-combined but still somewhat lumpy. Add the whey protein powder, soy protein powder, baking powder, salt and almond meal to the cheese and bean mixture. Blend again on low speed for about three minutes, or until the ingredients are thoroughly combined. Spoon the batter into the prepared loaf pans, place the pans into the preheated oven, and bake the bread for 30 to 40 minutes. When done, a toothpick inserted in the center should come out clean. Allow the bread to cool completely before slicing and serving. Keep refrigerated for up to four days. If necessary, use one large loaf pan instead of three mini-pans. This recipe yields 30 servings, or three mini-loaves containing 10 slices each. The bread contains 1.2g carbohydrates and 4.8g protein in each serving. Freeze any bread that will not be used within four days. To freeze, place the bread into a plastic freezer bag, squeeze out as much excess air as possible, label the bag with the contents and date, and place it in the freezer. To thaw, place the bread in the oven for 10 to 15 minutes at about 250 degrees F, or microwave individual slices on high power for 1 to 2 minutes. If you are following a low-carb diet plan, the University of Maryland Medical Center recommends choosing a plan that includes heart-healthy fats, and that does not severely limit your carbohydrate intake. Harvard School of Public Health: Protein - What Should You Eat? University of Maryland Medical Center: Low Carb Diets – The Right Way to Go?